The Broncos are to play a pre-season trial against the PNG Hunters. A FULL-strength Broncos squad will fly to Port Moresby next year, to meet Intrust Super Cup champions the PNG Hunters in a pre-season trial. Brisbane announced the clash on Thursday afternoon, in what will be a major boost for the game in Papua New Guinea. It is expected a full-strength squad will be flown over for the showdown on February 24, to meet the Hunters squad which claimed their first Intrust Super Cup trophy in September. Broncos CEO Paul White said this was an opportunity to give back to the community, with many Brisbane fans living in Papua New Guinea where rugby league is the national sport. “We know the Broncos have a massive supporter base in PNG and we are respectful of the fact that rugby league is the national sport in their country,” White said. “The Broncos are always mindful that our trial games are a way to give something back to the rugby league community and this trip to PNG will do just that. 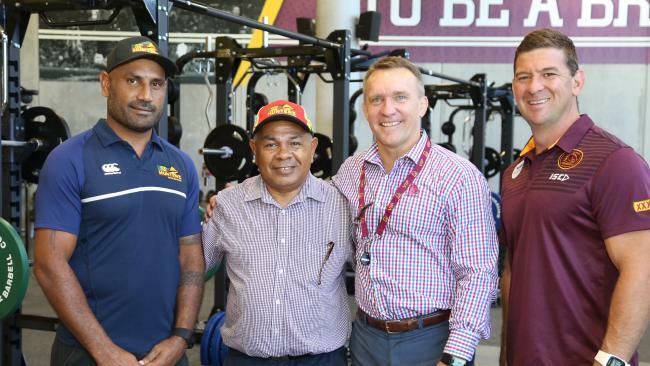 “This will take the form of not only the game, but also events and activities that will involve the wider community.” The trip is all the more fitting given PNG Kumuls captain, and the country’s favourite son, David Mead plays for the Broncos. The Broncos’ NRL season will then kick off on March 8 against the Dragons in Sydney.